Yes, I Love You Too. | The things I want to share with you – try to enjoy this short life you have! I am happy to say that we knocked off our first big item on our family summer bucket list! 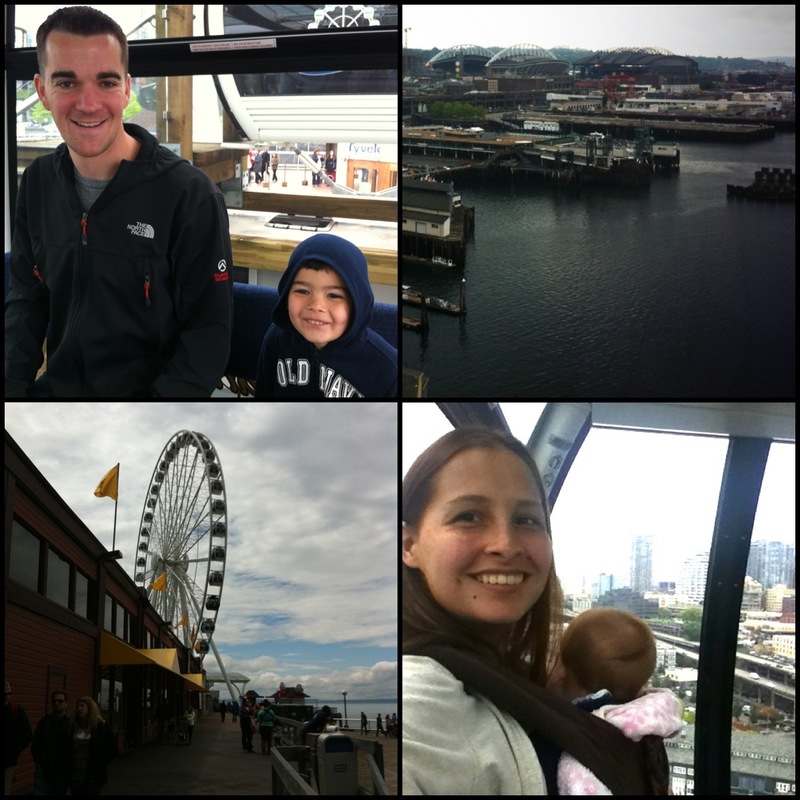 We made a trip to Seattle and took a ride on The Seattle Great Wheel ( http://seattlegreatwheel.com ). 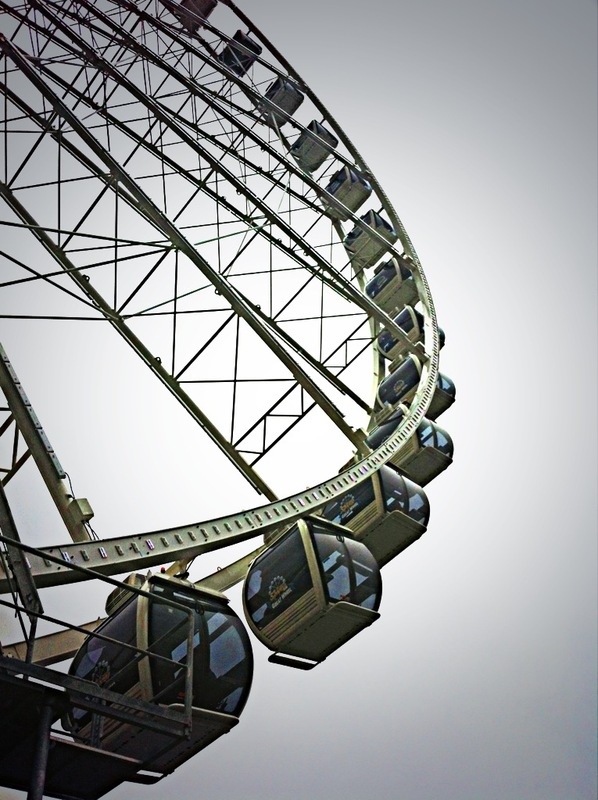 Our son was a little unsure about being up so high and said he was afraid but once we were standing in line he was excited that we were going to be riding the ferris wheel! I went ahead and bought our tickets online, had them printed, and once we arrived all we needed was our free pass for the baby. Everything worked perfectly, we didn’t have to wait in line at the ticket booth and our wait to get in a gondola was also short. It was a very fun experience and I am glad that my son enjoyed being up so high. 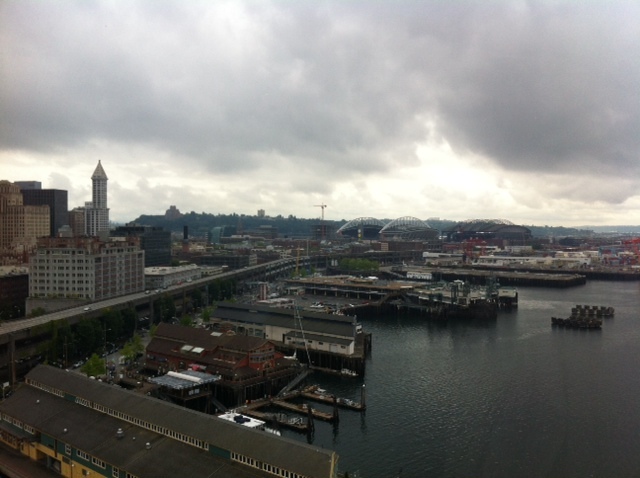 We had a beautiful view of the water front and Puget Sound even though it was overcast – as usual! I took the first picture while waiting in line. Then I had to start dancing to keep our baby girl happy since I had her in the Ergo and she was fussy. Thankfully, there was music playing through speakers while we waited to board a gondola! 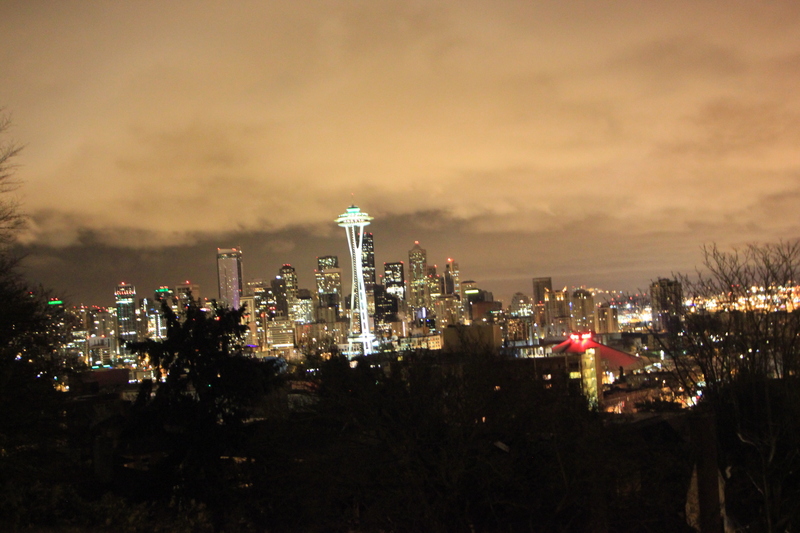 Below was our view of the harbor – beautiful! 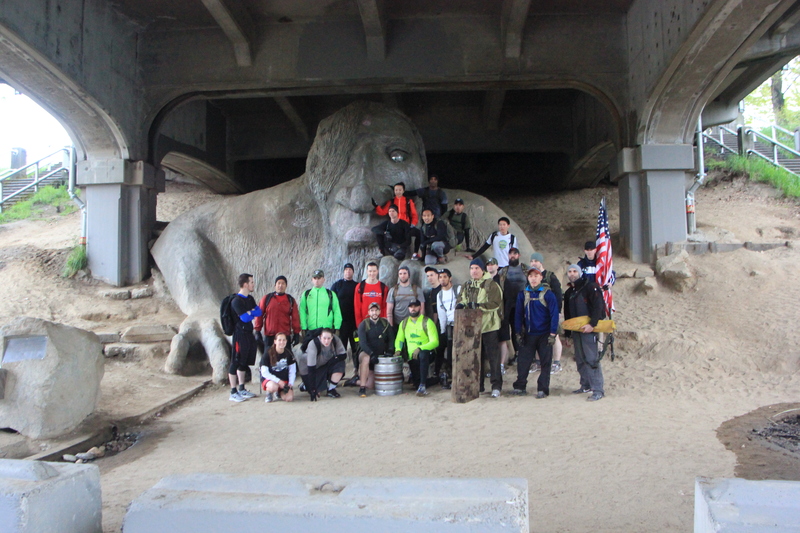 After the ride we had lunch and decided to visit the Fremont Troll under the bridge in Fremont ( http://fremont.com ). 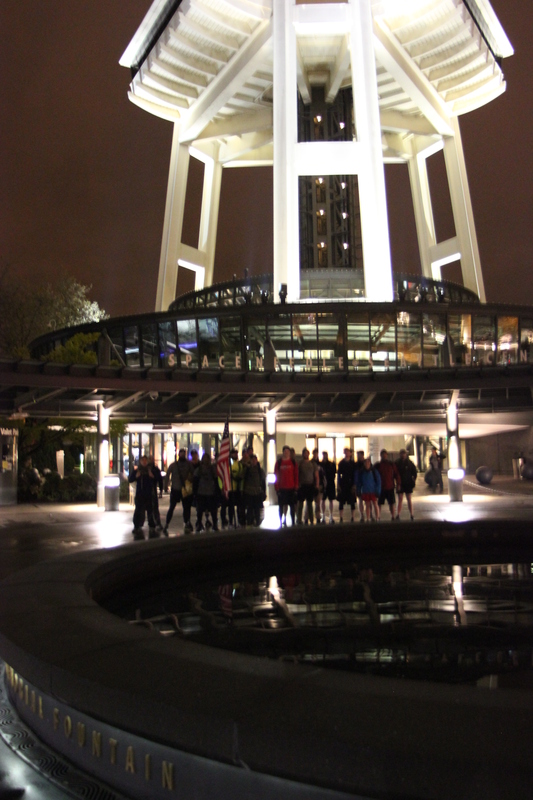 Even though this is not on our bucket list, we figured we would take advantage since we were already close to Fremont. 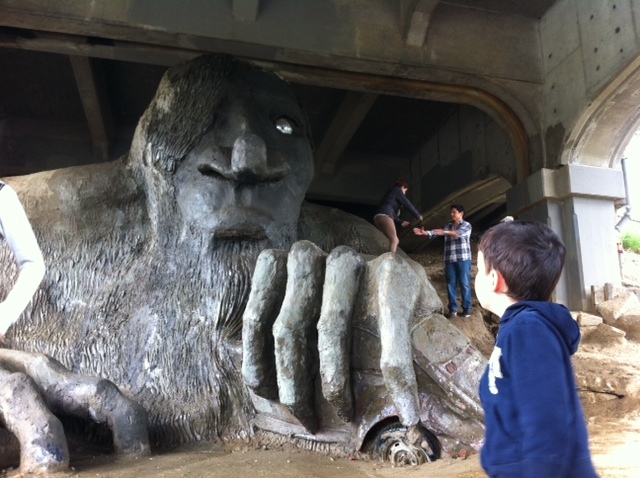 It took a few minutes for our son to warm up to the giant Troll under the bridge but once he did he was ready to climb! This is a fun spot to stop with kids! Beautiful – Respect yourself. 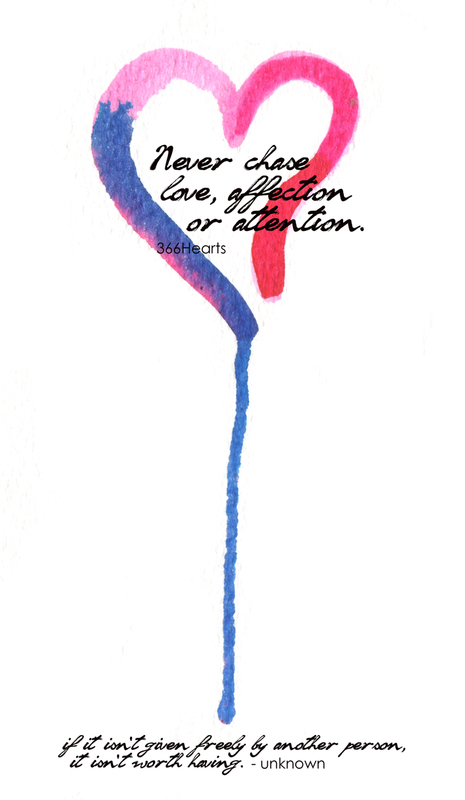 By 366 Hearts. So, this summer I decided that I can really do all of the fun projects that I have been wanting to do with my son. He is no longer a little kid – he’s a FOUR-YEAR-OLD. Okay? This means, we can do science experiments, make messes, build stuff, grow stuff, climb stuff, and who knows what else! And really, really enjoy doing all of this together! It is still fun to do things with your toddlers, but as your kids grow, it just becomes more exciting! Here is what we have done so far. Some of these ideas were borrowed from Pinterest (links included), some from his book of “101 Great Science Experiments” by Neil Ardley, and some of the ideas were mine. All of the pictures are ours! Enjoy! 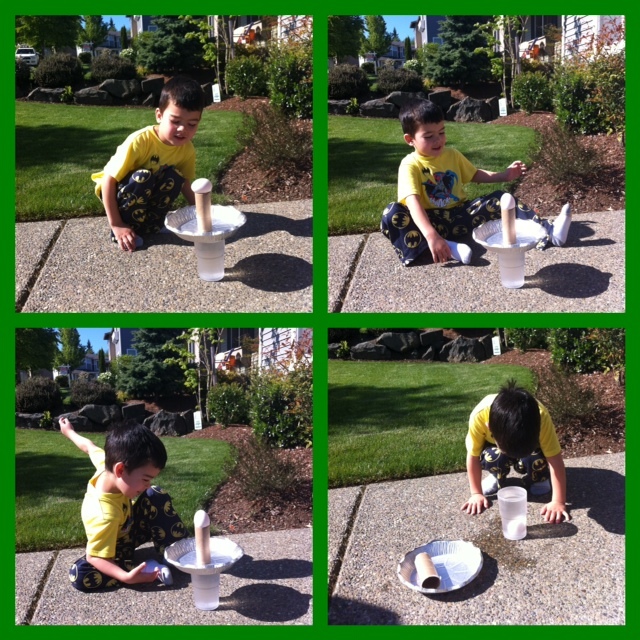 For our Science Week, we learned about water tension, the reaction between baking soda and vinegar, spent a morning at the Children’s Hands on Museum in Olympia, WA ( http://www.hocm.org ), mixed various liquids, and experimented with balance using an egg, toilet paper roll, pie tin, and cup of water. I grabbed one of my husband’s white button down shirts and a pair of goggles we happened to have and an old notebook that hadn’t been used. This became a lab coat, protective eyewear – not that we did anything dangerous – and our lab notebook. 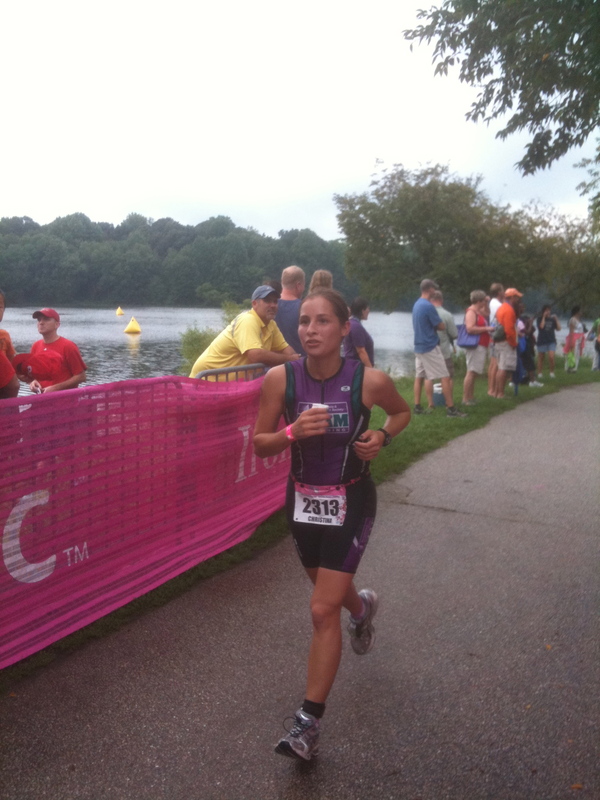 It’s just fun to look the part while you play! Here we go! 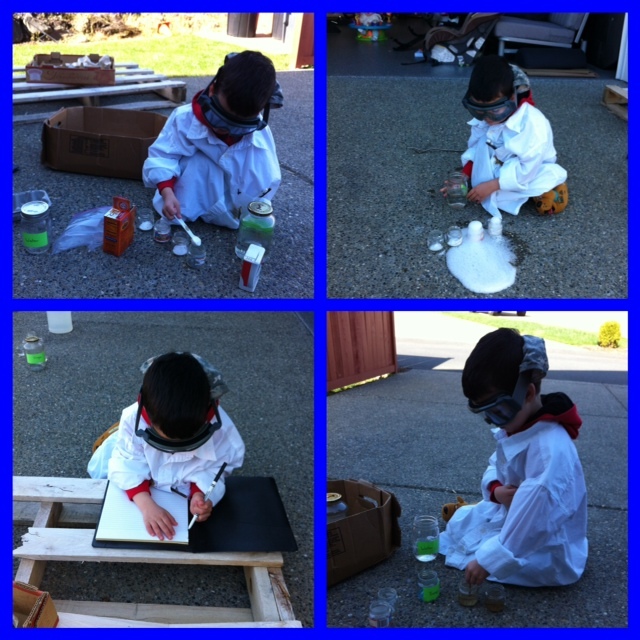 What you need: Baking soda, vinegar, water, pepper, soap, and jars. Above: We started small. First, we sprinkled pepper on water in multiple jars and then dropped a little bit of soap into the peppered water. It may not seem like much but for a little guy it’s amazing watching the soap make the pepper “run away” to the edges of the bottle or fall to the bottom. We did this multiple times and every time was a hit. Since he’s a little bigger and learning to write, we brought out the “Science Notebook” and wrote down words that we used for the experiment and little descriptions. For the baking soda and vinegar, we started with multiple small jars that had baking soda in them and added the vinegar. Each one bubbled up – which was “awesome”! We did the big jars a few times too. After we had fun just making a mess of things we decided to fill more jars with baking soda and vinegar. Only the last few times we also included descriptions in the science book about what was going on. It “bubbled” and was “white” and also made a “fizz” sound as the baking soda and vinegar reacted. Above: Fun at the Children’s Museum ( http://www.hocm.org ). It’s always fun to go just to play and explore. But THIS week we took our time and really read everything that we needed to do at various stations so that we could get the most out of our fun and learning. 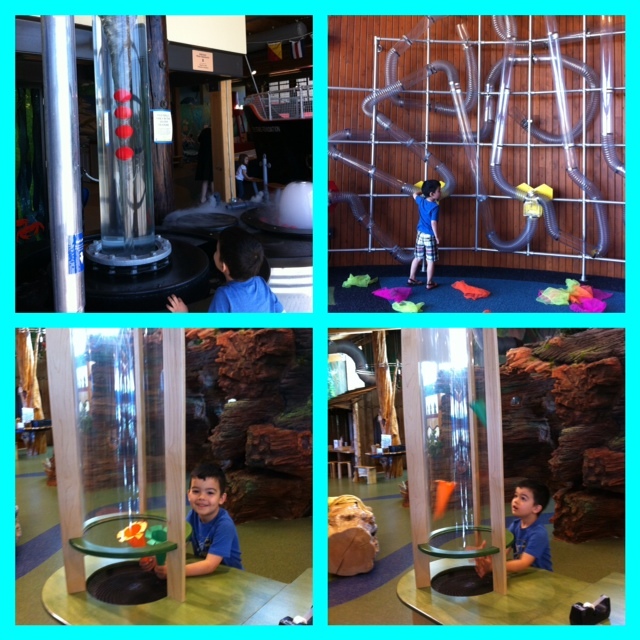 It was especially fun watching the water build up pressure and then shoot the plastic balls out of the spout at the top. We also experimented a little with the wind tunnels by first leaving the cones to see if they would float (they didn’t) and then adding slits and folding the paper back to expand the surface. Learning can be so much fun! Especially when you get to see it in action! What you need: RAW egg (I know! ), toilet paper tube, pie tin, cup of water, and lots of faith. You need a raw egg, toilet paper roll, pie tin, and a cup of water. Place the pie tin on top of the cup of water, stand the toilet paper roll in the pie tin, and then set the egg at the top of the toilet paper roll. 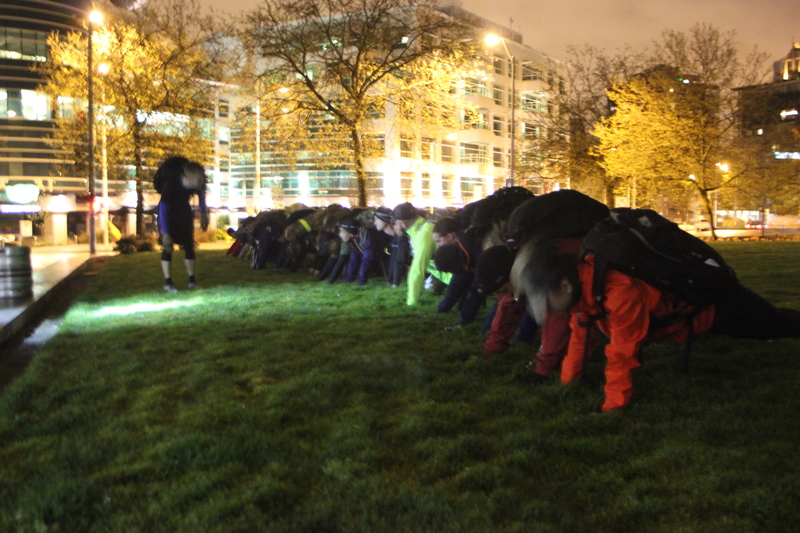 Check to make sure they are aligned with the cup of water and then SMACK AWAY! Hit the pie tin to the side and the egg will fall straight down into the water! Definitely fun, my kiddo set this up again and again! 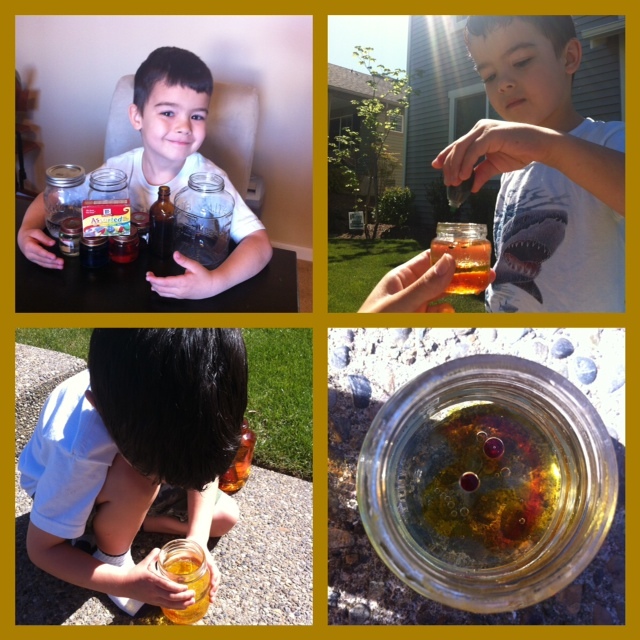 What you need: Water, oil, syrup, food coloring, rocks, sticks, leaves, and lots of jars! Above: “See How Liquids Float and Sink” and “Find Out if Liquids Mix” – both experiments out of the “101 Great Science Experiements” book by Neil Ardley. Boy, what a lot of fun! If you don’t have this book or one similar to it, you should! We filled jars with water, then added oil, and added syrup. It was fun to see where they all landed and how they worked with each other. We filled a jar with water first and then oil, then we added drops of food coloring. The pictures above show the food coloring staying as a little ball in the oil but then breaking into the water. Very fun to watch! We also added sticks and small rocks to our syrup, water, oil jars to see where everything stopped in the mix. A very interesting lesson in water density for small people! There you have it! Just a first in a series of fun and learning that will be going on in this place! Remember, it doesn’t have to be complicated! Almost everything here can truly be found around the house and will entertain little ones – for the bigger kids, just add a notebook and it can become a mad scientist’s experiment notes!